Out of all the rooms in your home, your kitchen gets the most traffic. Whether you’re getting ready to stage and sell your Connecticut home, or you’re unpacking kitchen items into your new home, you’ll want to have it perfectly organized to suite your life. Declutter. If the contents of your kitchen are overflowing, the first thing to do is get rid of what you don’t need. The best way to figure out what stays and what goes? Empty the contents of your kitchen drawers into a storage bin. If you use an item from the bin, it goes back in the drawer. After about a month, donate what’s left in the box to charity. The perfect pantry. Organize your pantry based on how frequently you use each item. Things like your slow cooker or roasting pan can stay on the top or bottom shelf, while you’ll want to have easy access to everyday items. Purchase a single brand of airtight clear containers to hold dry goods like pasta, grains, and cereal, so you can easily see what you have on hand. If you have children, place snacks at a kid-friendly height. Also, store canned goods with the labels facing outwards, with the nearest expiration dates at the front. Kitchen counters. Counters are your workspace, and when you’re showing your home, they need to be completely clear—yes, this means nothing should be stored on your countertops. 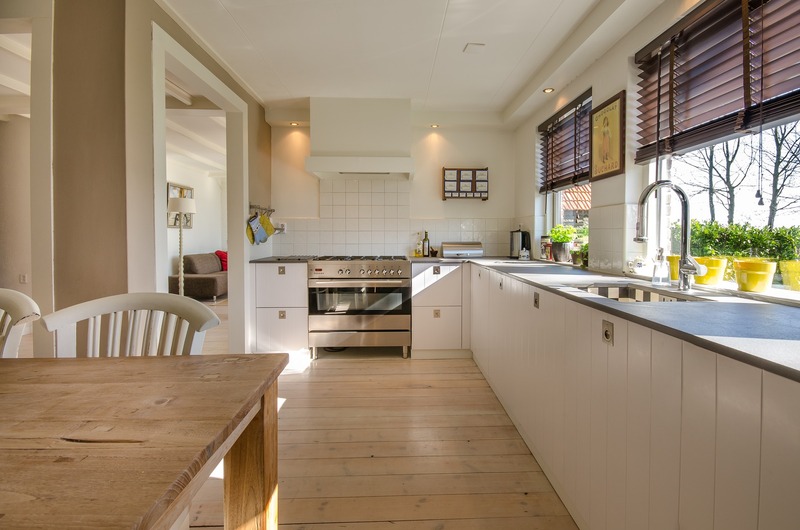 If you’re not selling your home anytime soon, your counters should still be kept clean. Keep small appliances out and ready that you use daily like the coffee maker or toaster but stow away items you use less frequently such as a food processor or stand mixer. Dishes and cutlery. Think of your kitchen in terms of workstations. If you usually plate your food straight from the stove or oven, storing plates, bowls, and utensils nearby will save you time. Serveware and dishes that you only use a few times a year, can be stored out of the way in cabinets or in your pantry. Pots and pans. You can save money instead of purchasing that pot rack that displays your pots and pans for all your company. This is generally a no-no. Potential buyers don’t need to see your used pots and pans. For easy cooking, store pots and pans in lower cabinets near the stove, and use the cabinet door space, or a magazine holder to keep lids in order. Spices. Similar to your pantry, store spices according to the ones you use most often. The best place for spices is a drawer near the stove (but not right next to it, because heat can spoil them). Keep the spices you use frequently near the front of the drawer and label the tops with their contents for quick cooking. Refrigerator. There are ideal spots for each kind of food. Store meat at the bottom, where it’s coldest, so leaks can stay contained. Keep dairy products on the upper shelves where the temperature is most constant, and stow bottles in the doors where it’s not as cold. Keep items that need to be eaten first near the front of the fridge, so you can enjoy these before they spoil. Not sure where to start? For more storage or organization questions, get in touch with your local Connecticut realty expert!